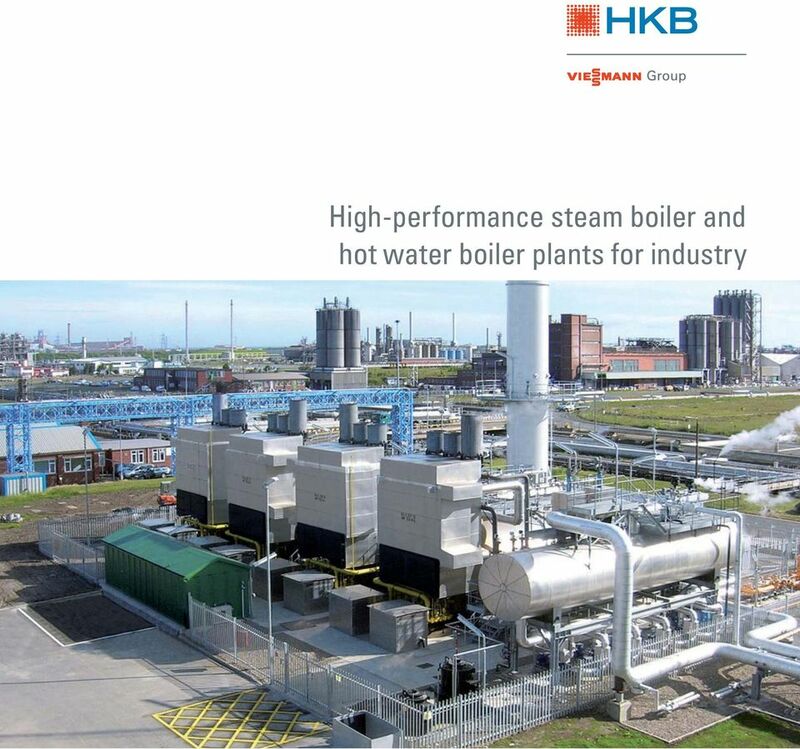 Download "High-performance steam boiler and hot water boiler plants for industry"
7 6/7 Product solutions and services from a single source HKB offers an extensive range of engineering services relating to energy systems, and on request can also provide support in developing individual solutions. A powerful energy system also requires pressure vessels, countercurrent systems, heat exchangers, compressed air tanks, flue-gas coolers, oil pressure vessels for hydraulics, process tanks and flue stacks. Quality inspection of a double flame tube boiler HKB supplies these modules in all common steel types, with the relevant acceptance certificates for all major markets: Europe EN 12953, TRD United Kingdom BS (British Standard) China Cina License North America ASME Russia GOST Our engineers actively assist customers and can participate in product development on request. 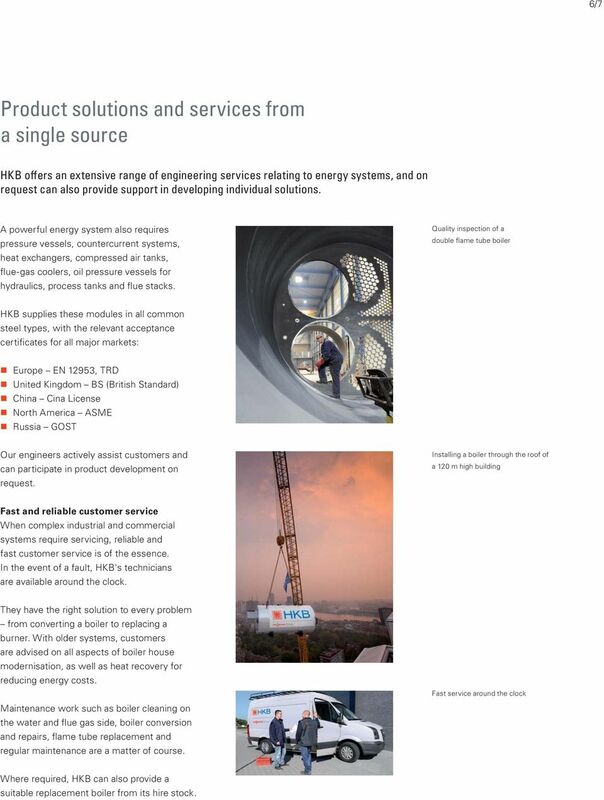 Installing a boiler through the roof of a 120 m high building Fast and reliable customer service When complex industrial and commercial systems require servicing, reliable and fast customer service is of the essence. In the event of a fault, HKB's technicians are available around the clock. 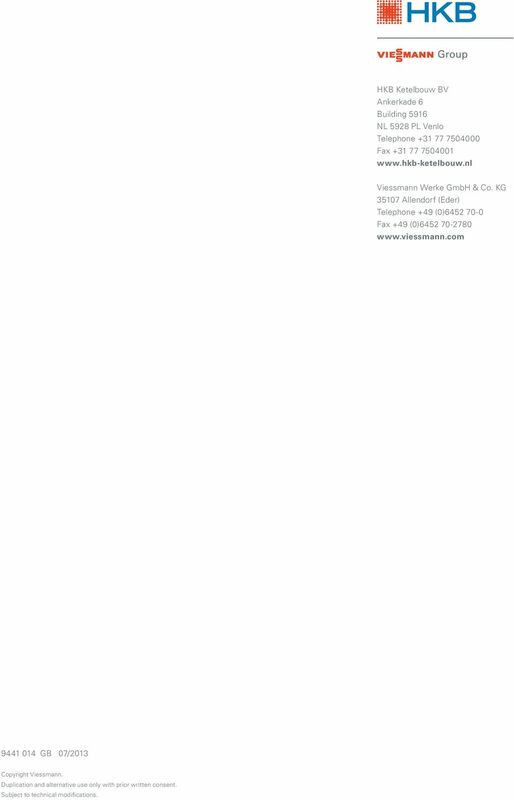 They have the right solution to every problem from converting a boiler to replacing a burner. With older systems, customers are advised on all aspects of boiler house modernisation, as well as heat recovery for reducing energy costs. Maintenance work such as boiler cleaning on the water and flue gas side, boiler conversion and repairs, flame tube replacement and regular maintenance are a matter of course. Fast service around the clock Where required, HKB can also provide a suitable replacement boiler from its hire stock. 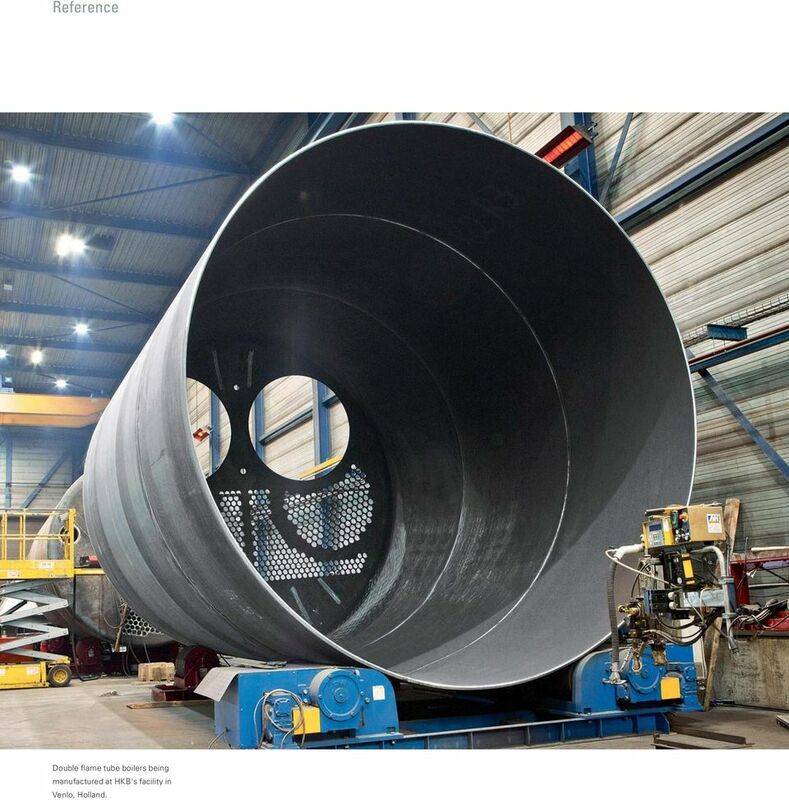 8 Reference Invisible text Double flame tube boilers being manufactured at HKB's facility in Venlo, Holland. 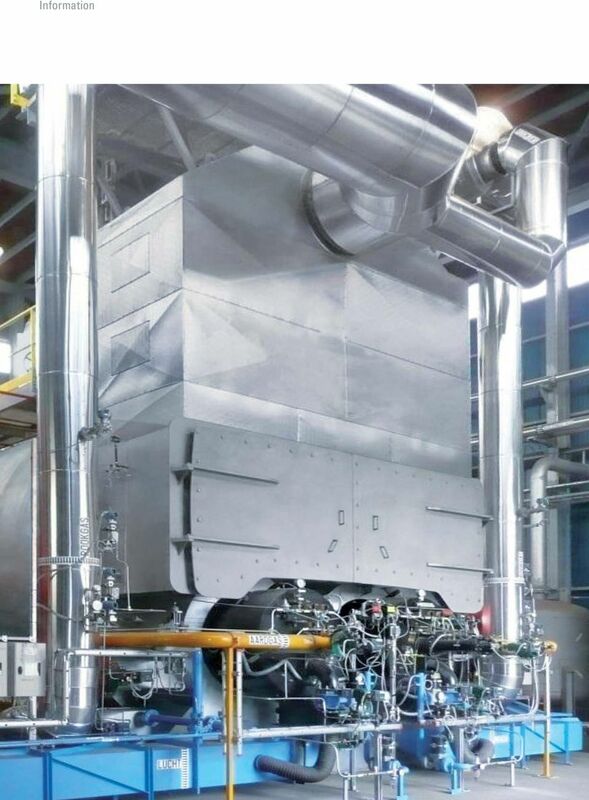 9 8/9 HKB installs two of the largest double flame tube boilers in the world The manufacture of high-quality paper products requires large quantities of process steam to smooth the paper. 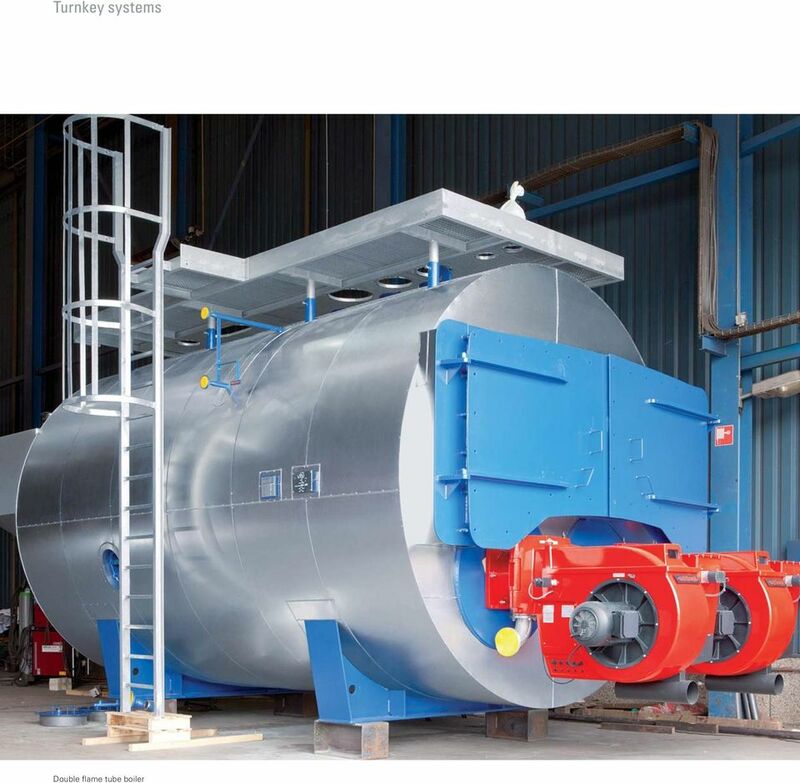 For projects of this kind HKB supplies customised large-scale industrial boilers. To ensure a reliable supply of process steam at a paper factory, two of the world's largest double flame tube boilers are being installed. Commissioned by Iggesund Paperboard SA, a leading manufacturer of cardboard packaging and paper, HKB is supplying the boilers to the company's Workington site in northern England. 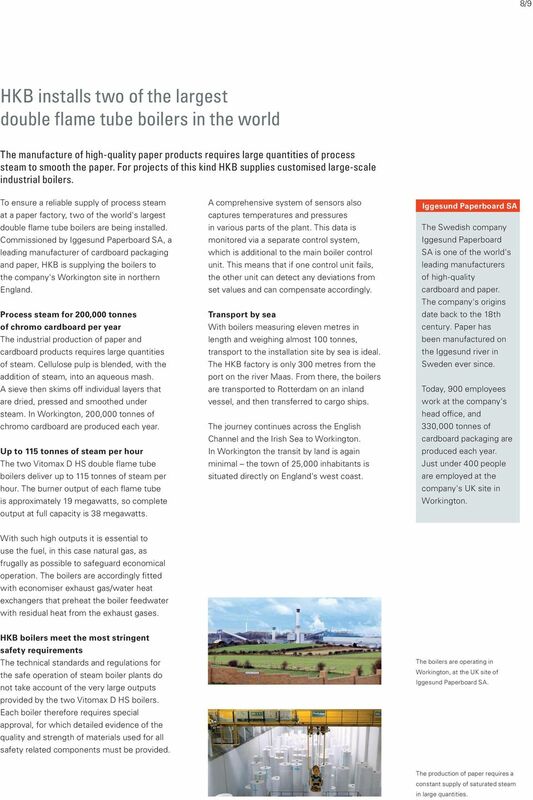 Process steam for 200,000 tonnes of chromo cardboard per year The industrial production of paper and cardboard products requires large quantities of steam. Cellulose pulp is blended, with the addition of steam, into an aqueous mash. A sieve then skims off individual layers that are dried, pressed and smoothed under steam. In Workington, 200,000 tonnes of chromo cardboard are produced each year. Up to 115 tonnes of steam per hour The two Vitomax D HS double flame tube boilers deliver up to 115 tonnes of steam per hour. The burner output of each flame tube is approximately 19 megawatts, so complete output at full capacity is 38 megawatts. A comprehensive system of sensors also captures temperatures and pressures in various parts of the plant. This data is monitored via a separate control system, which is additional to the main boiler control unit. This means that if one control unit fails, the other unit can detect any deviations from set values and can compensate accordingly. Transport by sea With boilers measuring eleven metres in length and weighing almost 100 tonnes, transport to the installation site by sea is ideal. The HKB factory is only 300 metres from the port on the river Maas. From there, the boilers are transported to Rotterdam on an inland vessel, and then transferred to cargo ships. The journey continues across the English Channel and the Irish Sea to Workington. In Workington the transit by land is again minimal the town of 25,000 inhabitants is situated directly on England's west coast. Iggesund Paperboard SA The Swedish company Iggesund Paperboard SA is one of the world's leading manufacturers of high-quality cardboard and paper. The company's origins date back to the 18th century. Paper has been manufactured on the Iggesund river in Sweden ever since. Today, 900 employees work at the company's head office, and 330,000 tonnes of cardboard packaging are produced each year. Just under 400 people are employed at the company's UK site in Workington. With such high outputs it is essential to use the fuel, in this case natural gas, as frugally as possible to safeguard economical operation. The boilers are accordingly fitted with economiser exhaust gas/water heat exchangers that preheat the boiler feedwater with residual heat from the exhaust gases. 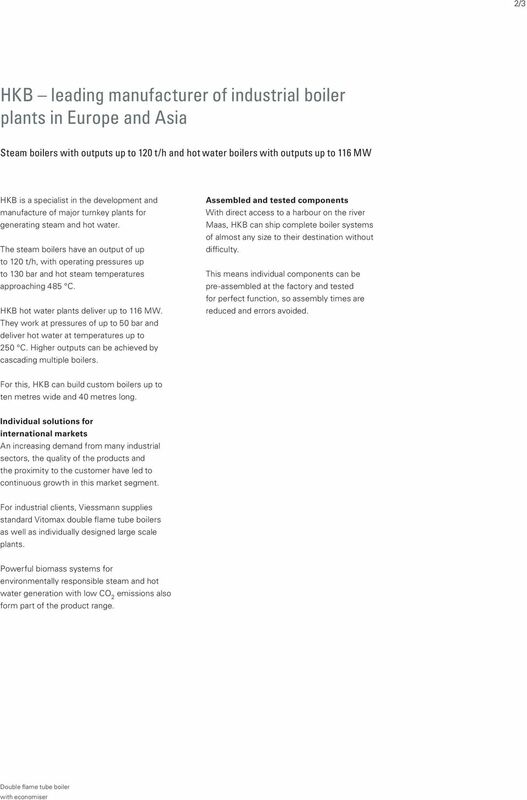 HKB boilers meet the most stringent safety requirements The technical standards and regulations for the safe operation of steam boiler plants do not take account of the very large outputs provided by the two Vitomax D HS boilers. Each boiler therefore requires special approval, for which detailed evidence of the quality and strength of materials used for all safety related components must be provided. The boilers are operating in Workington, at the UK site of Iggesund Paperboard SA. 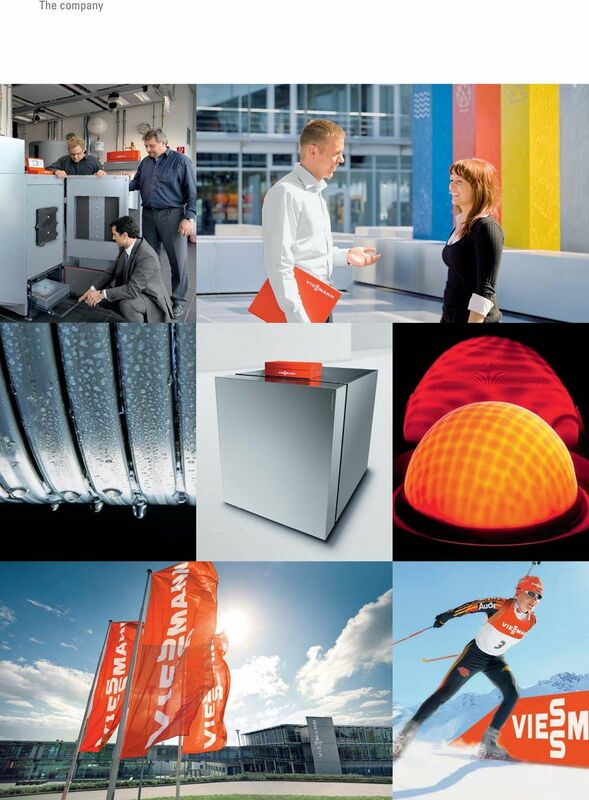 The production of paper requires a constant supply of saturated steam in large quantities. 12 HKB Ketelbouw BV Ankerkade 6 Building 5916 NL 5928 PL Venlo Telephone Fax Viessmann Werke GmbH & Co. KG Allendorf (Eder) Telephone +49 (0) Fax +49 (0) GB 07/2013 Copyright Viessmann. Duplication and alternative use only with prior written consent. Subject to technical modifications. Bioenergy. 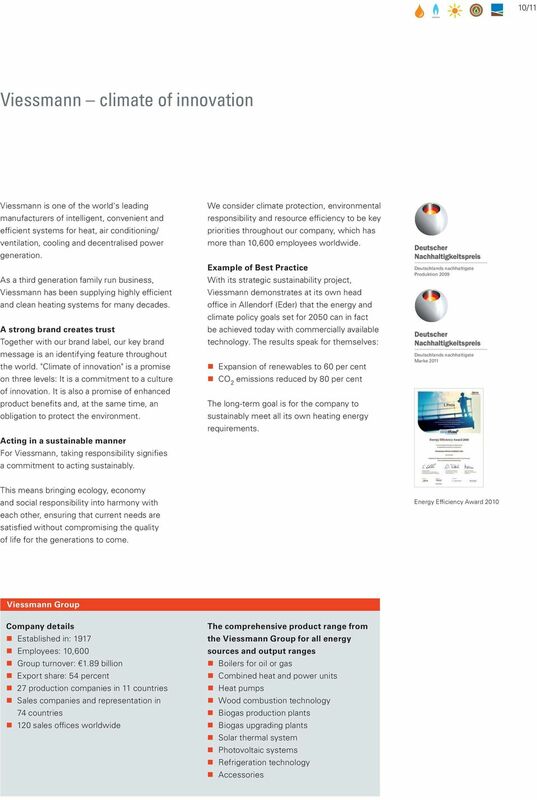 A sustainable energy source. 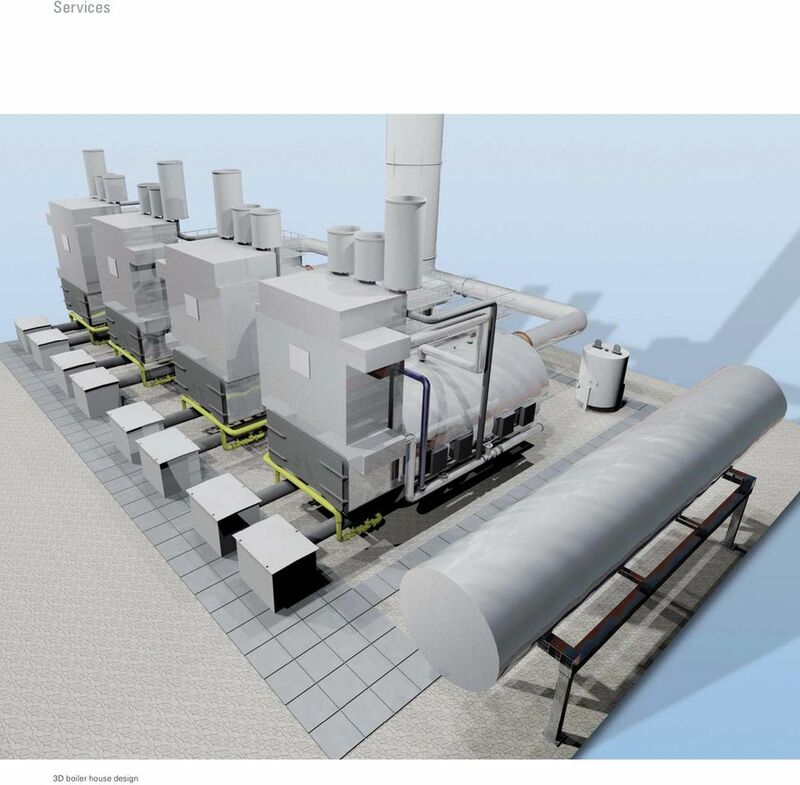 Heat Recovery Systems For GenSets: Is It Just A Lot of Hot Air? Alfa Laval in brief Alfa Laval is a leading global provider of specialized products and engineering solutions. SWEBO BIOTHERM. - Yesterdays residues are today s fuel. Ever thought it would be good to use energy twice? well, you can, through heat recovery. 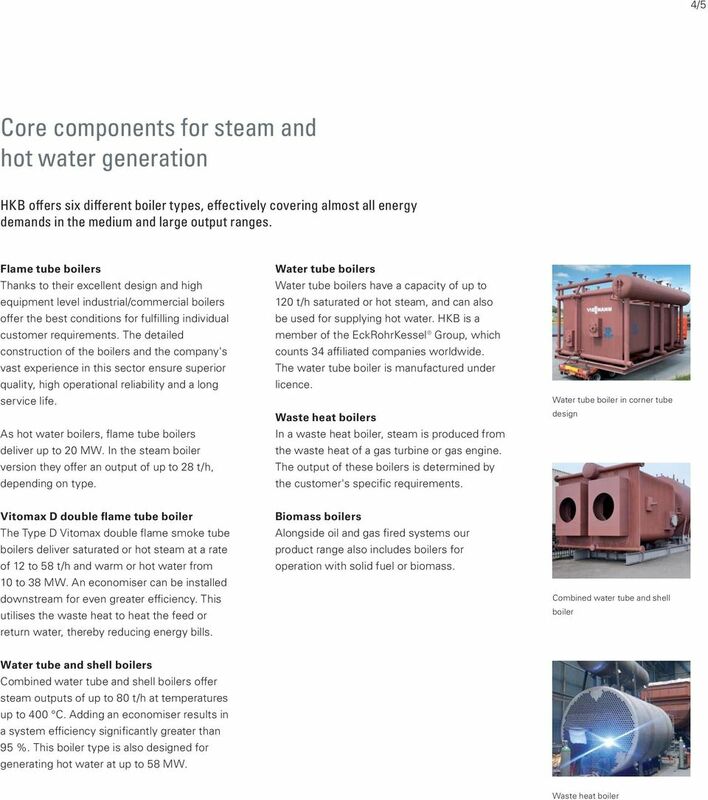 Steam turbines for solar thermal power plants. Industrial steam turbines. Answers for energy. Steam turbines for solar thermal power plants Industrial steam turbines Answers for energy. Power without carbon dioxide The advantage of solar energy is that the fuel is free, abundant and inexhaustible. Heat recovery. Let excess energy help your bottom line.